Diamela Atencio V: Mark Your Calendars! Our Annual Purse Auction is NEXT WEEK! Mark Your Calendars! Our Annual Purse Auction is NEXT WEEK! One of our favorite events is coming soon! Join us for lunch and our live auction of new and gently used purses and accessories! This event is always a hit with members and non-members alike. We welcome you to spread the word and bring a friend! We are currently accepting donations of new and gently used purses, umbrellas, sunglasses and scarves! Want to make a donation? Contact us today! The Women's Council of Realtors takes pride in supporting local charitable organizations. 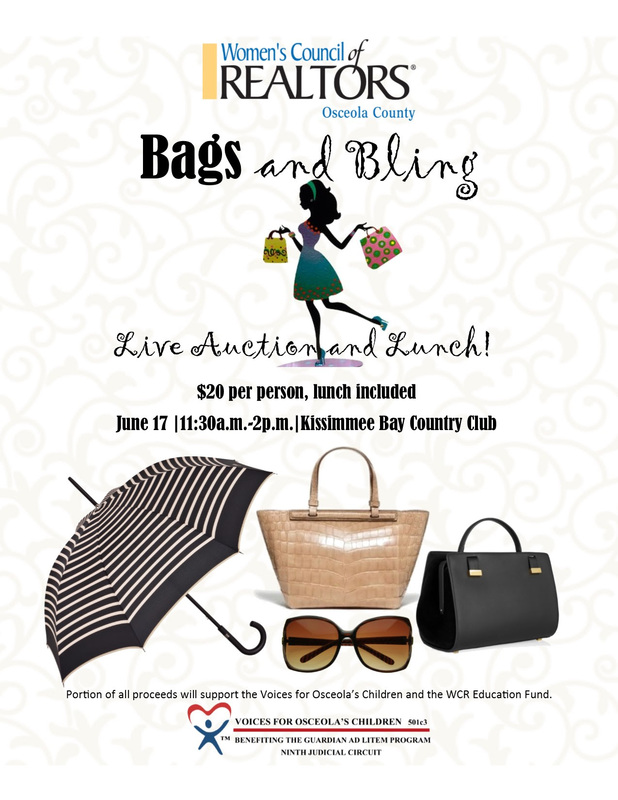 Our Annual Purse Auction benefits the Voices for Osceola's Children and the WCR Education Fund. By simply attending our auction, you're giving back! If you find that you want to be more involved, we encourage you to look intoVoices for Osceola's Children.